finn loves anna, originally uploaded by lisabagg. Finn was missing his cousin this week, so he wanted to make her a card. 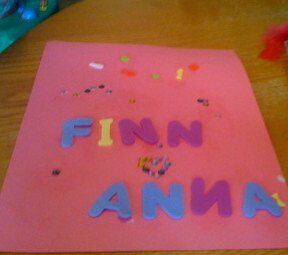 In his words, he wanted it to say, "Finn loves Anna, but the heart is made of sparkly jewels." It's a little hard to see in this picture, but the sheer volume of "jewels" (he used an entire bag) would have been too much even for J Lo. But nothing is too extravagant when it comes to his cousin. He told me today, "Mama, I even love you as much as Anna!" IMG_0287.JPG, originally uploaded by lisabagg. 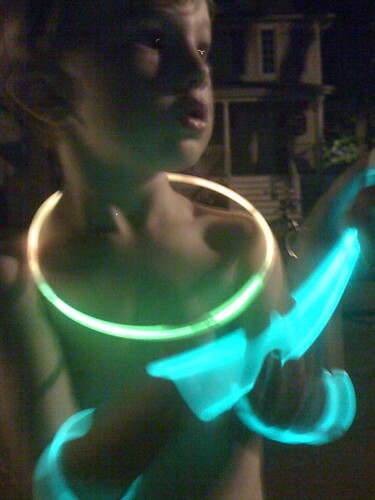 And here's Finn doing the "Cha-Cha Slide" way past his bedtime at the block party. 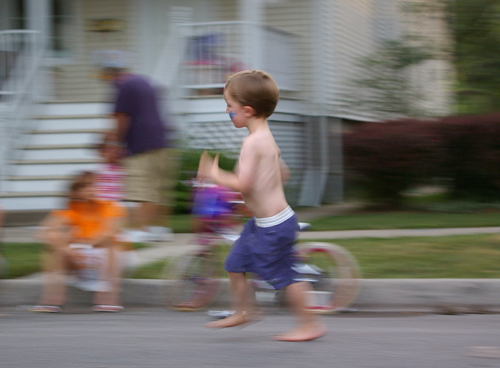 A bunch of shots from the chaotic free-for-all that was this year's Kilbourn Ave. Block Party. Finn took this photo, originally uploaded by lisabagg. As of today, Cormac has officially been on the outside as long as he was on the inside. Although the last time I checked, 40 weeks is technically 10 months, not nine. Yet, the myth of nine month pregnancy remains. Perhaps this is so women keep having babies, because the truth of double-digit months of pregnancy could be enough to endanger the future of the human race. But I digress! I'm here to report that Cormac is the most delightful, cheerful, little ray of light in the world. And I'm totally not biased here. Whenever he ventures into a crowd, adults and children swarm to him--he smiles heartily to them, claps enthusiastically, and if you're lucky, waves. At a street festival last weekend, he had two tattooed biker chicks absolutely cooing over him when he cast his gummy grin on them. In terms of temperament, Cormac can't be beat. He is amenable to pretty much any situation if he can sit on your lap. Go to the park with your brother? No problem--he'll just park himself in your lap. Pool with friends? Hey, as long as someone holds him in the shade, he's totally cool with that. I do have to report that he does have a bit of separation anxiety, which I kind of take as a compliment. This beautiful baby prefers my company over all others--that's pretty awesome. But being Cormac, he cools down and settles into someone else's lap, and is fine in no time. He has finally learned to crawl, and really getting around. As soon as I get my video camera fixed, I will post movies of his patented army-crawl-on-tippy-toes. He is into everything, and everything he gets his hands onto goes into his mouth. I had forgotten how all the rules change when they start crawling--I spend all the time that I'm not holding him staying five feet in front of him, baby-proofing as I go. 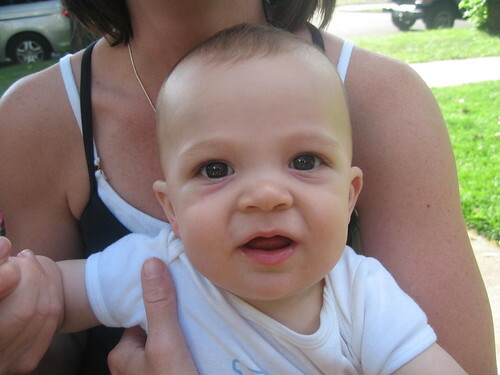 Happy nine-month birthday, Cormac! Promise me you won't grow up too fast. Cuppa, originally uploaded by lisabagg. Me: "Finn, you're the cutest little boy ever!" "THANK you, Santos! Look, Mommy! 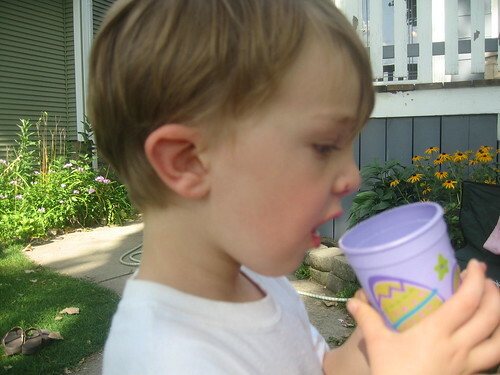 He chewed a bigger hole in here so it is easier to drink." (pause) "Will we need to take a horse to Texas?" "My brain told me that I should have jellybeans if I eat all my dinner." "Mama, why did God make freeways if there's still traffic?" "Mama, I like your hair, your dress, your necklace, your lip color, and the color of your skin." Brooke: "Lisa, why is Cormac's face so cute?" Rowan (to the tune of "Oh, What a Beautiful Morning") "Oh, what a beautiful Coooorrrmacc! Oh, what a beautiful daaayyy!" The weather has been pretty wonderful lately. And one of the things I love the most about summer is the impromptu Friday afternoons in the front yard. Someone brings pizzas, someone brings wine, and we've got a party. By the way, Finn took about half of these photos. Can you guess which ones?